@Sensibull : Thanks for a great tool i.e. Call or Put analyser. I have a little doubt while using it. While checking out the Greeks at the bottom of the page, I would like to understand the calculation when you change them on the 'per lot ’ basis. 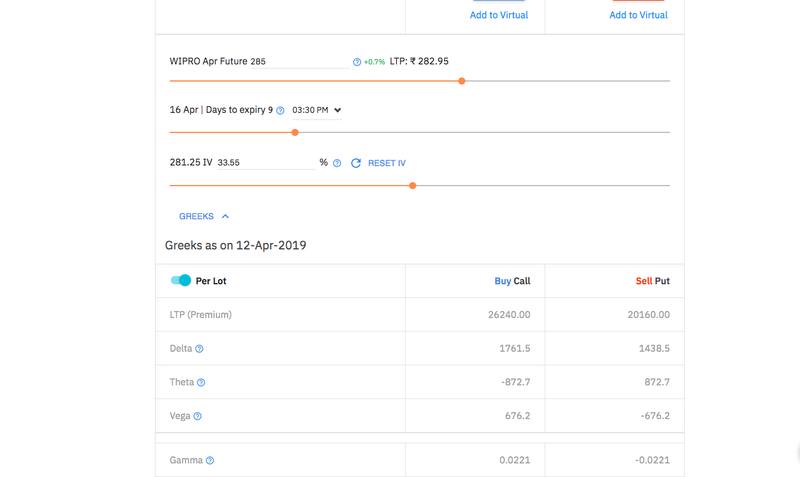 For eg.- Wipro has a lot size of 3200. So, for a 281.25 CE (LTP Prem- 8.20, target of 285, delta 0.55), lot level value should be = (285-282.95) X 0.55 X 3200 = 3608. However, the value I can see there is 1761.5. Attaching the screenshot as well. Am I doing sth wrong here? Thanks again for a wonderful tool! 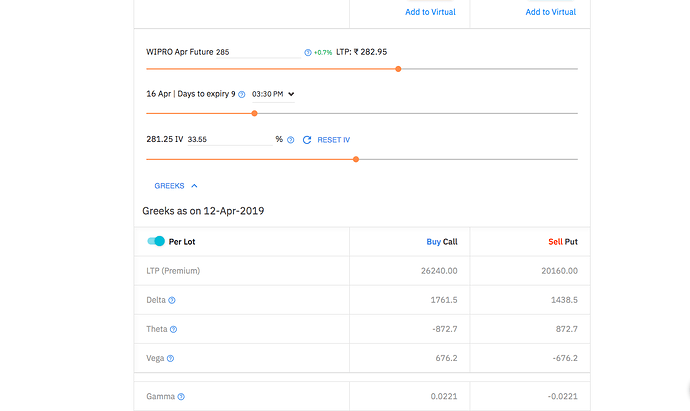 Delta is the option price change for a Re.1 movement in the underlying. Thanks for such a quick response!! Gamma and theta are always a positive numbers for both call and puts right but why here it is in negative am I wrong with my understanding.And wat are the values of delta theta Gamma indicating here.He is selecting slightly otm calls so let us assume delta as 0.3 for a change of 4rupees in the underlying 0.3*4=1.2 the new premium will be 9.40 ryt.